As more and more of us become canon deniers we thought a feature in which we could share and celebrate what each of us as individuals have in mind for Klaroline was in the cards. Only In Your Head is what we came up with. 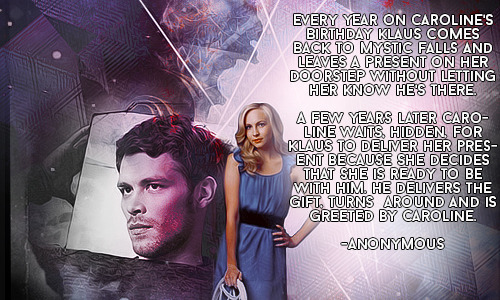 As the name suggests it covers the things about Klaroline that we can only can only enjoy in the realm of fanon and fandom, the things that are only in our heads- headcanons. It’s been a few months since we began collecting different headcanons on a wide range of topics, from how their reunion would play out to what their world-wide trips would entail to what habits would form during the course of their romantic relationship and we’ve been overwhelmed by the response. How Only In Your Head works is simple, we choose four of our favourite headcanons a month and post them along with why we liked it. At the end of the month we’ll have a poll to decided our Headcanon of the Month with next day results. Our first headcanon was sent in by an anon. We liked it because it’s just so Klaus (and because it conveniently overlooks the whole ‘I will never return to Mystic Falls again’ thing). We can just imagine him leaving her these birthday presents free of any indication of who they’re from but as soon as Caroline sees them she knows. Who else would know she’d been eyeing up that particular dress in the shop window every time she’d pass it (hybrid minions ftw) and the means to ensure the similar one sitting on her stoop cost more than the college loans she has no intention of paying off and is fresh off the season’s runways? It’s safe to say that we’ve accepted this headcanon for what it is- canon. Do you have a headcanon only in your head? Send it in and release it into the wild world of fandom today.